First Mode, so called City Mode (Note: software is installed in the same way for Professional Mode ). In this mode it’s implied that a client will have the main portal page separated from all other portal sections. For example, http://austinthebestcity.com – main portal domain, job section will be located inhttp://jobs.austinthebestcity.com, and real estate in http://realty.austinthebestcity.com etc. In this very folder you should upload “main_module” and run. After reading and agreement to License agreement you’ll be transferred to a standard page: a step, where a system checks all files and folders for permissions (writing). At a second step “Choose mode of site operation” please choose first radio button “City or Professional Portal”. 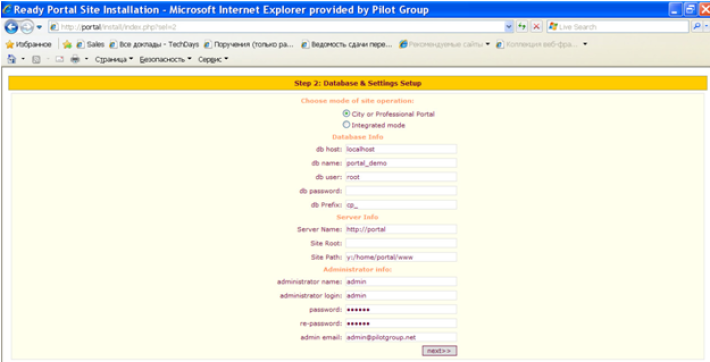 Also, at this step you’ll insert database data, paths and access information to your Administration page. When you click “Next” button all the data will be saved in configuration file and to the database. At the last step you’ll be asked to delete or rename “install” folder from your FTP. Also you can click a link that will run countries installation script for your site.